The Common′s partnership with Amherst College extends beyond the administration. The English Department, Creative Writing Center, and student-run prose and poetry magazine Circus have all collaborated with The Common in the past for events, public readings, book fairs, and writing workshops. 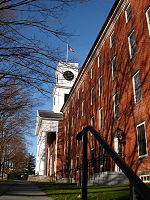 Additionally, some professors at the College, including William Pritchard and Pulitzer Prize winner Richard Wilbur, serve on the editorial board. Since the magazine’s founding, Jennifer Acker has begun work as a professor at the College, teaching some The Common′s pieces, among others. With this support, The Common launched its first issue, 01, in April 2011. The magazine has published eight issues to date, with a ninth expected in March, 2015. The Common has published new fiction by Lauren Groff, Fiona Maazel, and Sabina Murray, poems by Rafael Campo, Don Share, Honor Moore, and Mary Jo Salter. Its prototype issue included a piece by Jim Shepard. The magazine has also published the work of debut writers, poets, and photographers. Beyond the biannual issues, the magazine publishes literary features online, all freely available to the public. The website includes interviews, a fledgling podcast series, called Contributors in Conversation, a monthly recommendation of books from the authors and staff of The Common, called Friday Reads, Dispatches, short missives written by contributors evoking a particular sense of place, and other features not published in the print editions. In 2014, the magazine’s first year of eligibility, the National Endowment for the Arts awarded The Common an Art Works Grant. Other authors and writers, whose works have not been included in The Common, have praised the magazine and some of the stories it has published. The Best American Series, whose editors have included Dave Eggers, Denise Duhamel, Cheryl Strayed, Elizabeth Strout, and Mark Doty, has named particular The Common issues and stories as belonging to their top lists of prose, poetry, and essays between the years 2012-2014. The 26th Annual New York Book Show recognized The Common Issues 01 and 02, earning the magazine a second place literary magazine design award. The journal's editorial vision and design has also been praised in The New Yorker, The Boston Globe, Slate, The Millions, Orion Magazine, and The Chronicle of Higher Education. ^ Walker, Scott (26 April 2011). "Welcome to a New Literary Magazine, The Common". Orion Magazine. Retrieved 2013-09-09. ^ Petulla, Sam (15 February 2011). "New Journal, Old School Values". Inside Higher Ed. Retrieved 2013-09-09. ^ Peet, Lisa (28 June 2011). "A Sense of Place at The Common". Open Letters Monthly. Retrieved 2013-09-09.